Is a device with a 6-inch display even a smartphone anymore? The Lumia 1520 is so comically large that doing ordinary smartphone things with it feels like you're making a joke. At its best, the 1520 is a funny party trick. At its worst, it's absurd. A Windows Phone with a 6-inch display. The standard price for the 16GB model is $200 with a two-year AT&T contract. As phones have crept their way bigger and bigger, it's become clear that some people like their phones REALLY big. Microsoft, meanwhile, has found a lackluster response to its Windows Phone product despite major recent software strides. Perhaps, the logic seems to go, all those live tiles needed was a little room to roam. The Lumia 1520 is large. Noticeably so, even by the standards of big boys like the 5.7-inch Samsung Galaxy Note 3. It's a 6-inch diagonal slab of glossy polycarbonate that's just a tad smaller than a cocktail menu or a small tablet like the Nexus 7. It's got rounded sides and sharp corners. It's got a big, beautiful 1920 x 1080 LCD. The trio of standard Windows Phone buttons on the side of the handset are a tad more flush than usual and hard to get used to. But again, most of all, and I cannot stress this enough: this thing is gigantic. I'm not used to writing about whether or not smartphones are "pocketable," but since that's an issue with this particular device, let's begin there. The Lumia 1520 has two distinct states of being in the world. In the first, you're somewhere warm, and comfortable, watching sitcoms on your luxuriously large smartphone. In the other, you're attempting to pull a cumbersome, slippery hunk of glass and plastic out of your jacket pocket in the cold, which is when you drop it on the ground six hours after you got it. And it's definitely winter or you're wearing a suit because this thing isn't really designed for your pants. Who wears short shorts? Not an owner of this phone. So let's begin with the first use case, the one where you're delighted by the giant Full HD display. The homescreen that's peppered with a never-ending wall of live tiles glows like a warm fire. It's large enough that you can comfortably watch TV shows. I took a Skype call for work and had no problem reading a PowerPoint that was being shared with me. As you'd expect, games also look amazing on a big screen, and the device's Snapdragon 800 processor didn't have any trouble loading and rendering even some burlier games. And then... you pick the phone up and attempt to use it outside the comfort of your home or office, where the best part is handing it to your friends so they marvel at it. A random sample of about 20 friends revealed that 100-percent of people find this phone ridiculous. You shouldn't base your decisions on what your friends think, obviously. And in this case, you don't have to. Even in your own most private moments, this phone is a physical drag. I'm always amazed at Nokia's ability to make phones feel big, even when they're not. In this case, the 1520 actually is large, and it feels it. The design is aesthetically beautiful, but ultimately, it's a failure because doing basic smartphone things like looking up an address on the street or holding the phone up to your head are ridiculous. One-handed operation is basically impossible. Windows Phone's UI is curious because for all the times it's good, it's also frustrating. WinPho is painfully simple, which makes it easy for Mom to use, but it also means that basic features like a notification center are missing. The OS is getting better, and some of those long-absent apps like Instagram are supposedly about to drop. And Windows Phone's simplicity lends itself nicely to the small tablet form factor. The larger screen gives text formatting a little more space to breath2, which makes reading everything from the web to you email a little bit easier. The OS works well as a tap, launch, and lean-back experience. Maybe a teensy tablet is Windows Phone's destiny. As with all top Nokia handsets, the phone comes with the company's Pro Camera app, but unfortunately, the 1520 doesn't have the photographic prowess of the camera-centric Lumia 1020, or even the Lumia 925/928. The 1/2.5-inch, 20-megapixel sensor is relatively small compared to the 1020, and it uses a dual LED flash, which isn't as nice as the xenon flash on its Nokia compatriots. The results are what you'd expect: Acceptable in daylight. Garbage in lowlight. The 1520 is the first Lumia handset to capture RAW (DNG) files—support is rolling out next year on phones like the 1020. We tooled around with some shots in Lightroom, and the DNG files definitely open a lot of possibilities for improving photos. But in this case, we were kind of starting with total crap, so we'll be watching to see what some of Nokia's better cameras can do with RAW support down the line. 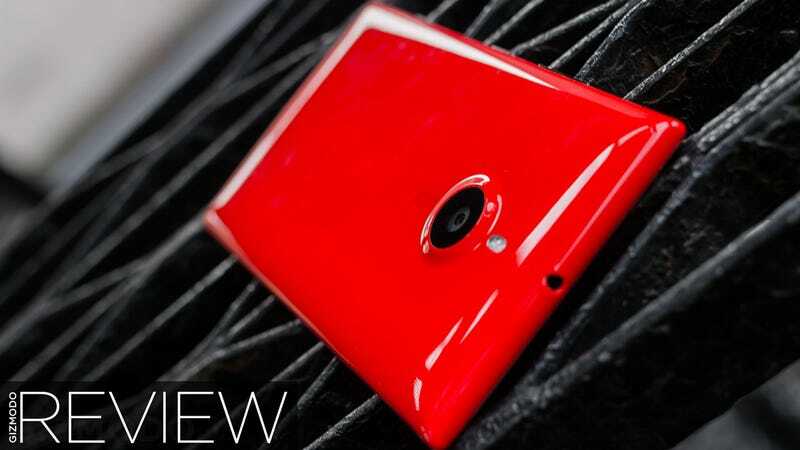 The Nokia Lumia 1520 is at best a novelty phone. It's a very nice small tablet. But if it's not supposed to be a smartphone, then why does it even exist? Video and games look beautiful on the screen. Really, everything does. The battery life is solid, considering the size of this monster. I never managed to kill this phone in a day. So large as to be useless to anyone who needs a degree of flexibility and mobility in their lives. Sure, once I'm comfortably situated at my desk or in bed or an airport lounge, that screen real estate is a joy. When I'm in line at the drug store, or calling upstairs so my friends can buzz me in, I not only feel and look like an idiot holding it up to my head—I'm decidedly being a moron. The usual gripes about Windows Phone apply. No. There will be the phablet phanatics out there who will make all of the stock arguments for why modern life doesn't even begin until you're holding at least 5.5 inches of smartphone in your hand. These people should go with a Samsung Galaxy Note 3, which has a smaller footprint, a slimmer profile, and actually affords you some conveniences for your trouble.